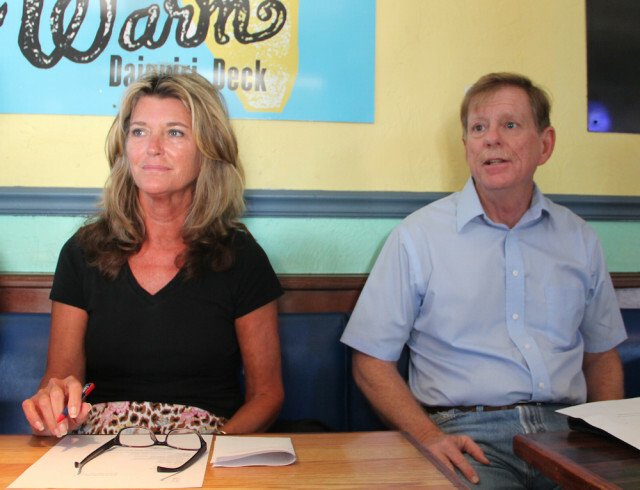 Another solution to the perpetual parking problem in Siesta Village is percolating, Siesta Key Village Association (SKVA) Vice President Mark Smith told members of the merchants’ organization during their monthly session on April 5. If a valet service charged people to park cars on private property in the Village, a certain percentage of the revenue would be turned over to the landowners, Smith explained. He has asked the representative of the valet service to draw up a proposal regarding some of those private properties, Smith added, so Smith can use it in approaching the owners about opening up their lots after business hours. “It’s not going to be a lot of money, but [the valet service does] have insurance; they cover everything,” he pointed out. “I think that would be a real positive step in the right direction,” Smith added. For well more than a year, Smith — who has his own Village business, Smith Architects — has been working on a plan to create supplemental Village parking. 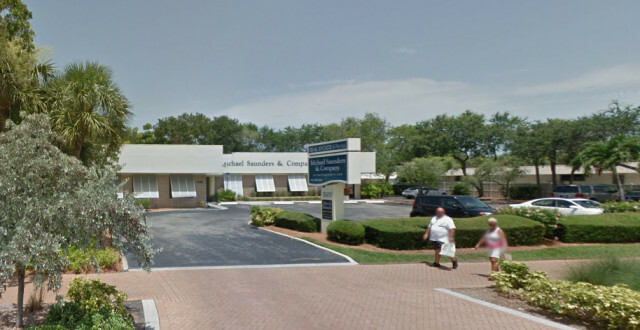 During the February SKVA meeting, he explained that, in meetings with county staff, it appeared the cost of creating about 90 new parking spaces out of rights of way around Siesta Village would cost $100,000. However, Smith reported later, county staff had told him no county money would be offered for such a project, and a number of the property owners in the Public Improvement District balked at the county suggestion that they cover the expense. 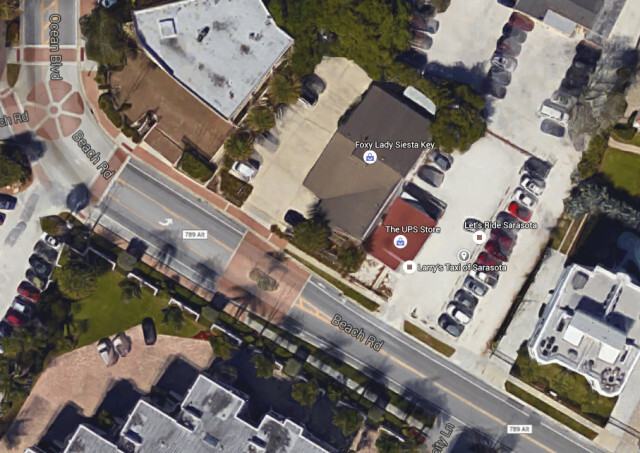 A county study in 2008, which included all the spots in the Municipal Lot, found 999 available spaces in Siesta Village, county staff told The Sarasota News Leader. Smith’s research indicated that close to 200 more spots for vehicles could be created through the use of private property, including the shell-covered lot next to The UPS Store on Beach Road — though a special exception from the county would be necessary for use of that area. Now it becomes a matter of whether private property owners want to assist with solving the Village parking problem, Shay summed up the situation. SKVA director Russell Matthes, co-owner of the Daiquiri Deck restaurants, also pointed out, that while he has seen many cases of visitors dumping garbage out of vehicles onto parking lot pavement, that would not be a concern with valet parking. When Shay asked what valet parking would cost to make Smith’s proposal work, Smith said the service would charge about $10 per vehicle. “The question is, Will that fly?” Shay replied, adding that he believes the valet services already operating in the Village work on tips only. Chris Brown, owner of The Beach Club, The Hub Baja Grill and The Cottage in Siesta Village, has told The Sarasota News Leader in the past that the valet service he employs does not charge the public, but people tip its drivers. 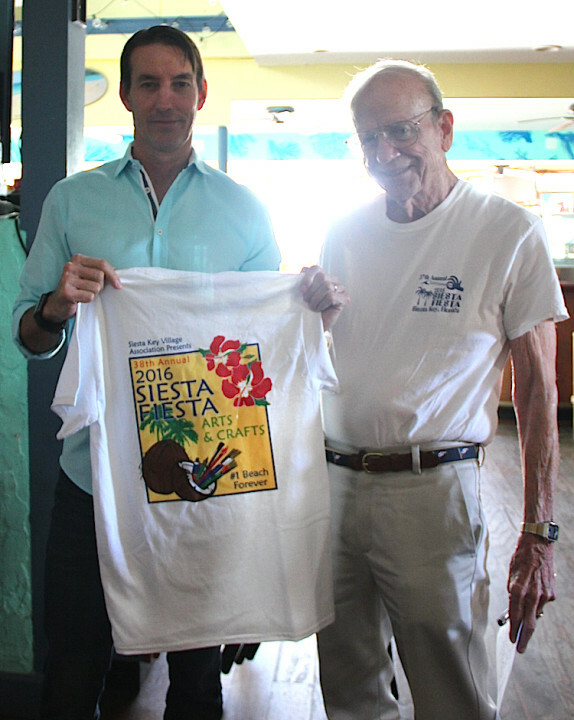 April 9 and 10 will see Siesta Fiesta once again “holding court” in the Village, but no street closures will be a factor this year, SKVA members have made clear. SKVA director Russell Matthes told members on April 5 he was not sure how many artists will have booths this year on the sides of Ocean Boulevard. The event traditionally features a wide array of media — with a resulting wide range of costs for items. SKVA members also will be selling T-shirts for the event, as usual, with a table set up between the Daiquiri Deck Raw Bar and Terrace East. Matthes and Terrace East condominium complex resident Peter van Roekens showed off a sample shirt after the meeting. “I was folding [the shirts] yesterday,” Matthes told the 16 meeting attendees, “and a ton of people kept walking up to me, asking about them. They’re good-looking,” he added of the tanks and T-shirts. Asked if the price remains $15 per shirt, van Roekens said that was correct. The proceeds support SKVA activities, which are designed to boost business for Village merchants. Van Roekens also reported that he would be sending reminders by email to all the volunteers who had signed up to help sell the shirts on Saturday and Sunday. Additionally, he voiced concern about an apparent leak in the vicinity of where he and Matthes plan to place the SKVA table to sell the T-shirts. 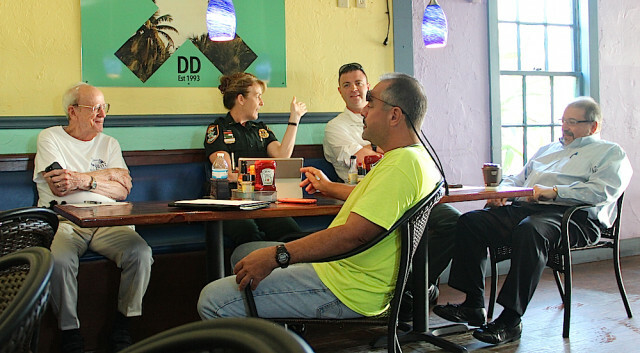 Shay, who also serves as the SKVA liaison to the Siesta Key Village Maintenance Corp., told van Roekens that county staff members would join him for a walk-through of the Village the following day as part of the monthly check on any issues that need addressing. He would ask them about the potential leak at that time. Of the 576 calls for service the department received in March, he continued, about 110 were related to illegal parking. Lt. Debra Kaspar added that the Sheriff’s Office had worked hard to try to prevent such incidents. Considering that illegal parking reports combined for “our predominant call for service,” Kaspar said, “I think we’re pretty fortunate …” Such requests for help were much preferable to those relating to burglaries or thefts, she pointed out. She did not have a count of the number of parking tickets deputies handed out, she told the SKVA members. 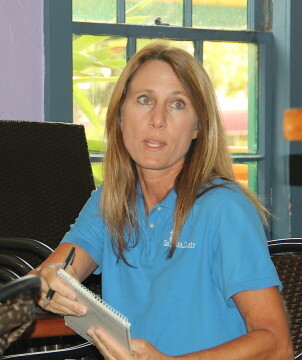 Mruczek also noted that the majority of charges for underage drinking in March involved people on Siesta Public Beach. Only about 10 or 11 percent of the charges involved Village incidents, he said. The Sheriff’s Office still is dealing with about 150 to 300 young people remaining on the beach until 2 a.m. many days, Kaspar continued. The Sheriff’s Office Mounted Patrol and deputies on ATVs work to disperse those crowds, she added. Overall, “we’re pretty happy” about the results of Spring Break, Kaspar said, considering how busy the Key was in March. During his April 5 report to the SKVA members, Peter van Roekens noted that Terrace East condominium residents dealt with “some really serious problems” about three weeks ago, as music continued at Blasé Café in the Village after the nightly cutoff mandated by county ordinance.